It’s that time of the year again to start planning your SEO marketing strategy for the coming year. It’s been a particularly busy year, with Google rolling out several major updates that affected many business websites. Given the direction Google is taking with their updates, you can expect another turbulent year in 2014 as Google refines its algorithms and develops the new Hummingbird algorithm. I want to walk you through what you can expect in the coming year, and how you can prepare for the changes that will be taking place. All of the lessons you learned about online marketing in 2013 are still applicable to your SEO marketing strategy for 2014, only in a more amplified way. Looking at the direction Google is taking with their updates will show you that the marketing plan you have in place as a result of the 2013 updates is a good place to start. Continue focusing on cleaning and diversifying your link profile. Scheduling regular link profile audits ensures you spot and remove any links built unnaturally, or any low-quality links that may affect your own website. Content remains to be the center of online marketing (more on that later), especially as Google search becomes more contextual with the Hummingbird algorithm in place. Producing and marketing high-quality content is a great investment for 2014. You will also need to weigh in other factors, which will be discussed shortly. Content marketing has been the most discussed element of SEO in the past couple of years, and it will continue to be the center of your online marketing campaign in 2014. Content marketing is maturing, and Google’s algorithm updates this year has already set you on the right direction. Hummingbird will improve this further as Google moves from delivering results based on keywords to offering SERPs based on context. Offering fresh website content, whether by adding new inner pages to your website, by updating your existing content, or by posting on your blog, is a great base for your content marketing campaign. Scheduling and publishing regular content updates on third-party influencer sites, increasing your social signals through social promotion and interaction, and boosting your online authority through traditional PR and Google authorship are other areas you should focus on in your content marketing strategy. Context plays an important role in content marketing. Because of Google Hummingbird, you no longer need to focus on exact match keyword optimization in order to rank for your industry. Instead, you should focus on the context of the content you present. Conducting market research and segmentation, choosing targeted topics, weighing in other elements of your marketing campaign (Where will your content appear? What device will they be using to view this?) and applying the proper tags and metadata will help Google read into the context of your content better. Google Hummingbird changes the way content is read. Context now plays a major role in your content marketing strategy. Social media’s influence is growing, and it will only continue to grow in 2014. Since the introduction of Google+ and the introduction of social signals as a factor for ranking on the SERPs, improving your social media strategy has become important. In 2014, you will see the continued rise of visual content on social media, with platforms like Pinterest, Instagram, and Vine becoming more significant sources of social activity. Optimize all your social media profiles, especially Google+. Make sure your information is updated and that it matches the information on your website. Enable social sharing on your website and cross-promote. Remember to promote your social profiles on your website, and promote your web content on your social media properties. Implement Google Authorship on all your content properties and on your website. This will establish you as an author and increase your author rank, which is a good trust signal for Google. Review your social marketing strategy in line with algorithm updates, and determine what social signals are correlated to your positive movement on the SERPs and to higher goal conversions. 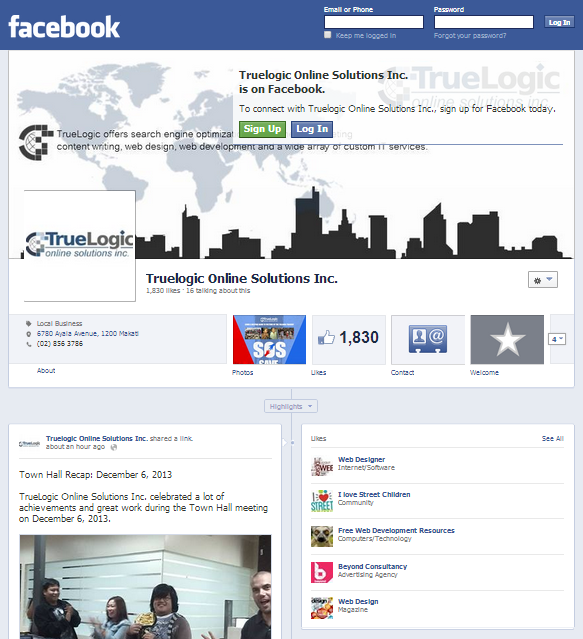 Our official Facebook page is regularly updated with industry news, discussions, and our blog posts. Because of the holiday season, mobile users are expected to increase dramatically at the beginning of 2014. When 2013 began, the Philippines boasted 64% Internet-capable mobile phone ownership, and 30% of all mobile phones owned by Filipinos are smartphones. This market is expected to grow in the years to come, with the number of Filipinos online expected to double by 2016. What you have here is a big opportunity for mobile marketing right before it booms. Mobile SEO should be made part of your campaign. Creating mobile-optimized web designs is no longer an option; it’s the minimum requirement. Optimizing for local also becomes more important than ever, as searchers using mobile are most likely to expect locally relevant search results. Integrating these marketing strategies together helps you become more visible in the mobile SERPs. Hummingbird also plays a huge role in mobile marketing. Its focus on contextual meanings instead of merely on keyword matching allows users to ask questions semantically instead of having to think of keyword combinations. This is in preparation for voice search in mobile. Focusing on the context of your content will help you both rank for mobile and desktop SERPs. One of the biggest challenges of 2014 is how to address the continued loss of organic search referral data. Google began in September by announcing they will make this information secure. They were followed shortly by Yahoo! announcing that they will be offering their users the option to encrypt their information, and then by Microsoft when they announced they are exploring secure search for Bing. Earlier this year, I shared the three ways we address the loss of organic search referral data in a blog. You can check it out for tips. Another way is through Google AdWords and PPC campaigns. AdWords is still offering the encrypted data for clients with active campaigns on the PPC network. As a result, more businesses have moved their campaign budgets towards PPC. It could go two ways in 2014: Google may keep offering the encrypted data in AdWords to push their PPC profits, or they may offer a separate service where they will make the data available for a price. The points discussed above are the major areas of SEO that are changing now and will be changing continuously as 2014 begins. It’s important to focus on these areas as early as now to ensure your business stays visible and relevant online even as new Google updates are rolled out. We’d be glad to help you prepare for the coming year. Talk to us today about your needs and we’ll create an online marketing strategy for 2014 that’s tailored for your business.